Lock in a great price for La Villa Boutique Hotel – rated 8.7 by recent guests! The staff was extremely friendly and helpful. They provided us with a list of restaurants and tourist attractions we could visit. The grounds are beautiful and well maintained. And the food from the restaurant was delicious. My wife and I were very comfortable and enjoyed every minute of our stay. I felt at home once I got to La Villa Boutique. They offer free airport transfer and that went smoothly. The room felt so clean and spacious. The aesthetic touches also made the room even more enjoyable. The service was excellent during my entire stay. Beautiful poolside garden area, perfect for relaxing or working. The cooling system in the hotel is not the best. I changed 3 rooms and the AC was not working properly. Otherwise, the rest is ok. The room was fantastic and bathroom super clean. The fanciest place we have stayed in Africa. The pool was clean and beautiful. The restaurant was great food, especially the breakfast. Overall a great way to start our trip to Ghana. Would definitely recommend! I really enjoyed staying at this property as it's very clean and has a nice restaurant by the pool where it's quite lovely to spend your evening. The menu can easily cater for western preferences. The room I had was really big and had a small balcony, the bed was very comfortable and water was provided in the room and replaced with new bottles every day. Staff at La Villa were amazing, Emelia gave us a fantastic welcome and we felt at home from the onset coupled with recommendations of places to go by (Michael (Porter). We were also invited to a event at the hotel (thanks to Winnie) and got to meet some business locals which made our stay even more special. Overall great location, close to bars and restaurants, staff amazing and rooms were clean and tidy. Will definitely return for another stay!! Location is excellent -- very convenient. Staff was truly wonderful, very helpful and very accommodating. They also provide a local phone in the room which was of great use for making calls, etc. Overall ambience of the hotel was really enjoyable overall. Very green for being in the middle of the city, and had a very nice aesthetic -- very boutique, not like a cookie cutter Marriott. One of our top picks in Accra.La Villa Boutique Hotel is located in Accra, a 6-minute drive from Kinbu Gardens and an 8-minute drive from Crescent beach. It offers an outdoor swimming pool, a terrace and an onsite bar. 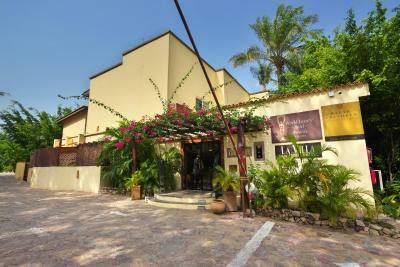 All units at La Villa Boutique Hotel are air-conditioned and decorated in a contemporary style. Each one also has an private bathroom and some include a private balcony with views. After enjoying the included continental breakfast, you may choose to organize an excursion at the 24-hour reception or book a massage. An airport shuttle service is available with an extra cost. North Ridge is a great choice for travelers interested in business, markets and nightlife. When would you like to stay at La Villa Boutique Hotel? This air-conditioned room features a wardrobe, desk and safety deposit box. The room comes fitted with a flat screen TV with satellite and cable channels. The room is equipped with ironing facilities. The room has a mini-bar. Guests can enjoy city and garden views from the room. A private bathroom with free toiletries can be found in the room. The room has a mini-bar and dining area. The unit also has a balcony with outdoor furniture. Guests can enjoy city and garden views from the room. The room has a mini-bar and a kitchenette with a microwave, refrigerator and kitchenware. The unit also has a balcony with outdoor furniture. Hotel surroundings – This neighborhood is a great choice for travelers interested in business, markets and nightlife – Check location Excellent location – show map Guests loved walking around the neighborhood! House Rules La Villa Boutique Hotel takes special requests – add in the next step! La Villa Boutique Hotel accepts these cards and reserves the right to temporarily hold an amount prior to arrival. Taxi drivers recommended by the security staff try to cheat guests (should be managed by reception). Nicely kept rooms and well-kept garden and idyllic pool (wich is more for decoration than for swimming though). Great location in Osu. The bedroom furnishings, especially the cupboards, could do with a little upgrade. I loved the surprise cake and bottle the hotel threw in for my birthday. The door of shower requires for repairmen and wasn't cleaned well. Treated like family! Love staying at La Villa!! So comfortable and cozy. Tucked away and yet in the middle of things. The room upstairs is showing signs of disrepair - a wardrobe handle missing, grouting gone in between the tiles in the shower, European plugs for the kettle and desk lamp precarious in ill fitting sockets. Excellent location, beautiful pool and garden area. The staff are extremely professional and attentive. The food is good and bar staff are very welcoming. Lovely location, nice pool and a good room. Very friendly and helpful staff, spacious rooms (some with recently refurbished bathroom), nice atmosphere (not as sterile as big hotels). Pool is smaller than you would think looking at the pictures on the website, in fact more of a big jacuzzi. The apartment I had for the first night was not as nice -if you don't need the extra space & kitchen, rooms are the better choice. As for many places in Ghana, price is quite high for what you get. The breakfast was included in the booking, which was great, but I wouldn't say it was a *Great* breakfast. The staff is accommodating and there are well-staffed -- it's hard to find good customer service in Ghana. They were very nice. The pool is amazing and peaceful. Even though the location was in Osu it was very quiet.